ELSMERE — Firefighters responded to an electrical fire outside the Good Samaritan Nursing Home on Rockefeller Road at approximately 4 p.m. on Monday, Jan. 14. The electrical fire was isolated to a utility pole outside one of three housing units on the north side of Rockefeller Road. The fire knocked out power and heat to the unit, which houses approximately 40 residents. The nursing home is comprised of three housing units separated with residents in hospice care, assisted and independent living. According to Elsmere Fire Chief Frank J. Wickham the fire affected those residents living in the independent living home. 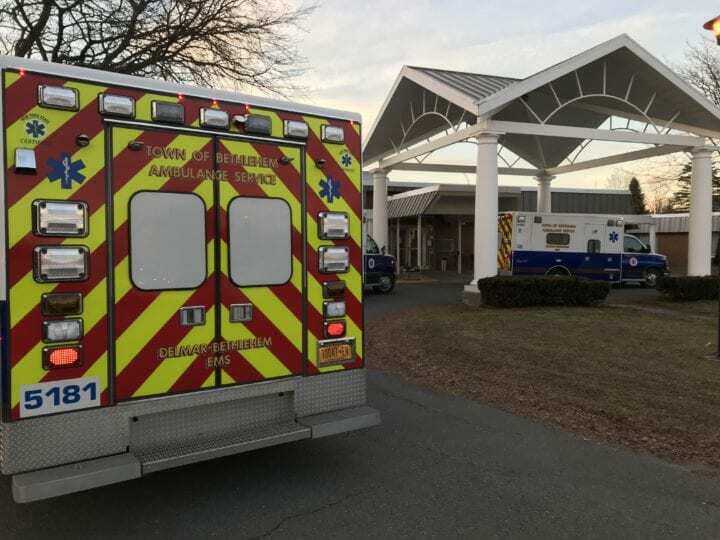 Emergency crews responded with several ambulances lined outside the nursing home’s main entrance. Elsmere Fire also dispatched a bus for a possible evacuation. Chief Wickham said there was a concern residents would need to be moved to a neighboring unit to keep warm from freezing temperatures. National Grid trucks arrived at approximately 4:45 p.m. to resolve the power and address the badly burned utility pole.